Creating a healthy, happy workplace can play an instrumental role in the overall performance and eventual success of a business. There are many reasons for this, such as the simple fact that having healthier people in your workforce reduces sickness absence and maximises productivity. 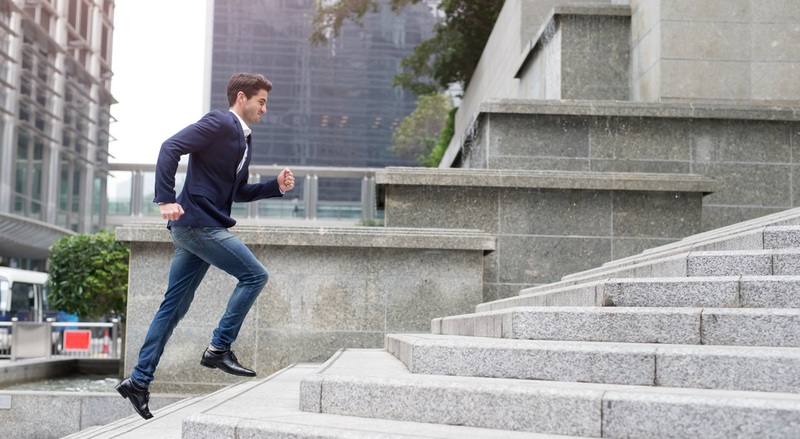 Furthermore, people who feel that their employer is making an effort to protect their health and wellbeing will feel more loyal to the company, lowering employee turnover and recruitment costs. Another big benefit of good physical health is that it contributes to a positive mental outlook, helping to ensure that people feel calm, confident and happy in their work. In many offices, workers tend to spend a lot of their time in a sitting position. This can lead to all sorts of possible health problems, from everyday aches and discomfort to more serious, long-term issues such as chronic back pain or even cardiovascular disease. Height-adjustable desks – also known as ‘sit-stand’ or ‘up-down’ desks – can help to address this problem by giving employees the option to raise their working surface and spend some of their working day standing up. This simple change can have a big impact on long-term health. Much like height-adjustable desks, standing meetings give people an opportunity to get out of a sitting position and spend some time on their feet. Simply standing up and moving around helps to get the heart pumping and the blood flowing, which supports general health and fitness. Moreover, you might find that encouraging people to have meetings standing up encourages communication and collaboration between colleagues, which could lead to positive results for the business. Offering free snacks in the office is a common perk, but one that can be highly important to busy workers who need to keep their energy levels up throughout the day. Supplying indulgent treats like chocolate, doughnuts and crisps might go down well with staff at first and are great as a treat, but healthier alternatives such as daily fresh fruit are a good option will prove much more beneficial in the long run. Encouraging workers to keep themselves fuelled with high-energy foods such as bananas and nuts will support workforce wellbeing while helping the company to run efficiently. Non-stop working is never a good thing. As well as making individuals feel tired and burnt out, excessive working can hurt the business because it increases the risk of people making mistakes. Team leaders and senior figures within the workplace should encourage people to take regular breaks, particularly at busy times of the year or during challenging, stressful projects. Sometimes, a few minutes spent outside in the fresh air can make a big difference. It’s not only in the workplace that a business can support the health and wellbeing of its employees. There are many things you can do to help people to stay fit and healthy, such as encouraging walking or cycling to work instead of driving or taking public transport, or arranging activity days where your employees can get some exercise while bonding with their co-workers. By taking these sorts of actions, you can contribute to the long-term success of your business by looking after the people who keep it running day in, day out.